Continuing the international theme of this year’s Vale Earth Fair, the collective are proud to welcome Jamaican Reggae artist Tall Rich to Guernsey for a night of roots reggae. Born in the East of Jamaica in 1969, Tall Rich grew up surrounded by music. Raised by his grandmother, his uncle was also a strong influence. Known as Uplifter, he was a powerful & inspiring singer who spread his knowledge and teachings of Rastafari Livity through his music, best known for his hit single Africa Bound recorded with dancehall star Capleton. Despite relocating to the US at the age of 9, his formative years surrounded by singers like Everton Blender, Sluggie Ranks, Trevor Sparks, Frankie Paul and Chuck Fender has shaped his creative side, and finally sees the recent release of his debut album Changes – some 15 years in the making, and recorded with the likes of Tippa Irie (check out Credit Crunch on You Tube https://www.youtube.com/watch?v=tvO45ZqsQPM). His vocal style is reminiscent of classic reggae singers like Dennis Brown and Joseph Hill of Culture, blending roots consciousness with dancehall riddims. Now based in Bristol Tall Rich is now pushing his music career to the fullest, and he has a strong message that he wants to be heard. This is a man who is conscious in every aspect of the term, teaching and praising the words of Rastafari - he speaks about current issues, relating to those who feel the realities of the world today. He has a signature sound in his voice, a unique spiritual positive vibe that distinguishes him from other current reggae singers. Bringing to the surface the strength of his spirituality & expressing his philosophies of Rastafari to upbeat sounds and lover’s rock riddim’s, Tall Rich is a name you will hear in a dancehall, in the home, and on the radio. 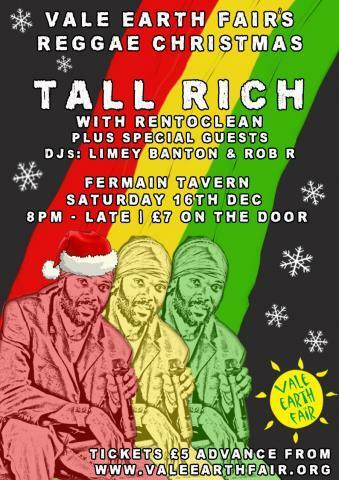 Tall Rich will be backed on the night by our own Rentoclean, and with DJ sets from Limey Banton and Rob R, it promise to be a rare night for lovers of reggae, with some special guests yet to be added to the bill.